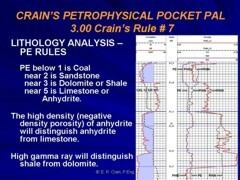 Publication History: This article was prepared especially for "Crain's Petrophysical Handbook" by E. R. (Ross) Crain, P.Eng. in 2005, based on CWLS LAS File Documentation , 1988. This webpage version is the copyrighted intellectual property of the author. Log data has been recorded on magnetic tape and on discs for many years. Originally, the tape formats were unique binary formats (LIS, DLIS, BIT, TAP, etc) that could only be read by the service companies that created them. Some petrophysical software suppliers provided tape reading capabilities, but the many format variations defeated many attempts to load files. To overcome this problem, the Canadian Well Logging Society (CWLS) struck a committee in 1985 and 1986, chaired by Case Struyk, to develop an ASCII formatted file that could be viewed easily in a word processor and read by commercially available analysis software. The result became known as the Log ASCII Standard (LAS) file and is now a de facto worldwide standard. The CWLS receives no royalty and little credit for this work. Over time, the LAS standard has been updated to reflect changes in computer technology. The first published version was labeled 1.20, and Version 2.00 is the most commonly used version, although version 3.00 has been published also. LAS file editing and repair software is available from KC Petrophysics (free and commercial versions). LAS depth plotting software is available for free download HERE (15 MB ZIP file). This is an older Schlumberger progarm (2004). ~V and ~A must be the first and last sections respectively. Other sections can be in any order. The list above is the most readable for humans. The "VERSION" section containing the version number of the LAS format and identifies whether the data is in wrap mode or not. Wrap mode is a method for handling lines of data that exceed 80 characters (including delimiting spaces). The "WELL INFORMATION" section contains information on the well name, location, and the start and stop depths of the data in this file. The "CURVE INFORMATION" section contains the curve mnemonics, units used and definitions of mnemonics, in the order that they appear in the data section. The "PARAMETER" section contains information on parameters and constants and is optional. The "OTHER" section is also optional and contains any other information or comments. The last section is always the "ASCII LOG DATA" section. Depth values should appear in the first column and each column of data must be separated by at least one space. This data is usually formatted into columns with 3 to 8 significant digits. Tbe "#" character is used to indicate comment lines that are not read by the computer but are helpful for human readers. The first space after the period character is also a delimiter. All other spaces are ignored. VERS. 1.20: CWLS log RSCII Standard -VERSION 1.2. LAS Version 2.0 was introduced in 1992, and was widely adopted all over the World. In Version 2.0, the punctuation delimiters are in a different arrangement. Data entries in the ~Well Info section now are in front of the colon, instead of after the colon, giving all sections the same format, as shown below. Parameters and Other data sections are set up in the same format as the Well data section. Abbreviations are not standard in these sections. 1. New Data types. (Core, Drilling etc). 2. "Structure" rules separated from "Content" rules. 3. New delimiters and structures. 4. Comma Tab and Space delimited data. 8. Floating point, string, integer, Date and Time formats supported. 10. WRAP YES has been dropped. 11. ~Other section has been dropped. This new format is considerably more complicated than Version 2.0. As a result it has not been widely adopted and the vast majority of work is still done with Version 2.0 format files.